William Hill is a very respectable (and popular) UK betting shop that has developed a good online betting website for its players. The odds are decent and the website is fairly easy to use, however it does not excel in either area. Overall, the William Hill online betting shop is solid, but I would prefer to use Betfair or Ladbrokes for when it comes to placing bets online. William Hill is one of the most recognizable betting shop names that you are likely to come across. For many, William Hill is the primary betting shop for offline bettors. By all accounts, William Hill runs a very good online betting shop website. Everything works smoothly and the odds are decent. However, I feel that there are better betting websites out there to choose from, and so I would recommend that you try other online betting websites unless you have a strong preference for William Hill. The Betting Odds at William Hill online are decent. They are not bad at all, but at the same time they are not exceptional. There is also the option of betting over the phone at William Hill online. William Hill is in the same boat as the Bet365 betting shop, in that I would not use the site as my first choice for placing a bet, however I would use it when comparing the odds across a number of respectable betting sites. The odds can be quite favorable at times, but in general they are usually pretty standard. 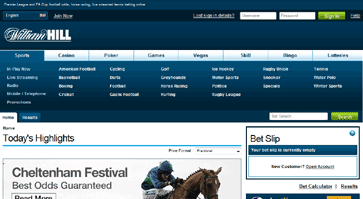 On first impression the William Hill betting shop website looks very clean and attractive. It appears to be one of the classier betting shop website designs. However, when it comes to placing a bet it is not quite as easy to use as I had hoped. Don't get me wrong, it is far from being difficult or frustrating when betting, but it is not quite as simple as the Betfair betting website. It is unlikely to cause any problems, but I prefer the layout and structure of other websites. William Hill is a very big company, and it is clear that they pride themselves on providing great support to their online players. As you would expect from any respectable online betting shop, the support is friendly and quick to respond to emails. The best way to get in contact with William Hill is through either their email contact or support telephone number. You can expect a quick response through both. William Hill offers all of the major deposit and withdrawal options, so there should be no problems for anyone looking to make payments via Debit/Credit Card or via an online wallet. Deposit and withdrawal times are standard. The withdrawals are not the fastest I have come across, but you will not be waiting a overly long period of time for withdrawals to be processed.